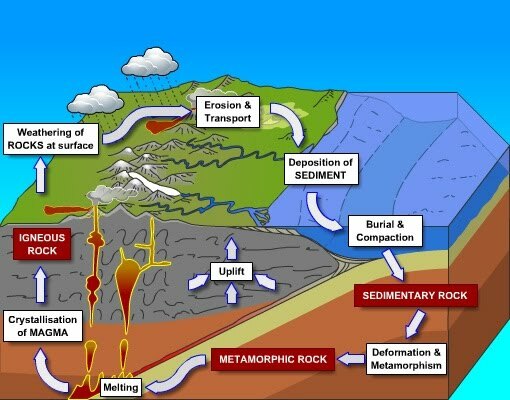 Students know Earth processes today are similar to those that occurred in the past and slow geologic processes have large cumulative effects over long periods of time. Students know the history of life on Earth has been disrupted by major catastrophic events, such as major volcanic eruptions or the impacts of asteroids. Students know that the rock cycle includes the formation of new sediment and rocks and that rocks are often found in layers, with the oldest generally on the bottom. Students know that evidence from geologic layers and radioactive dating indicates Earth is approximately 4.6 billion years old and that life on this planet has existed for more than 3 billion years. 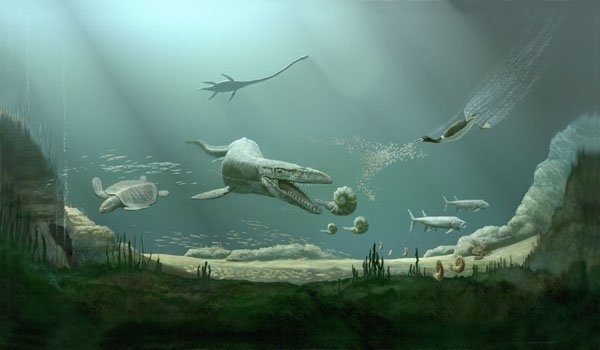 Students know fossils provide evidence of how life and environmental conditions have changed. 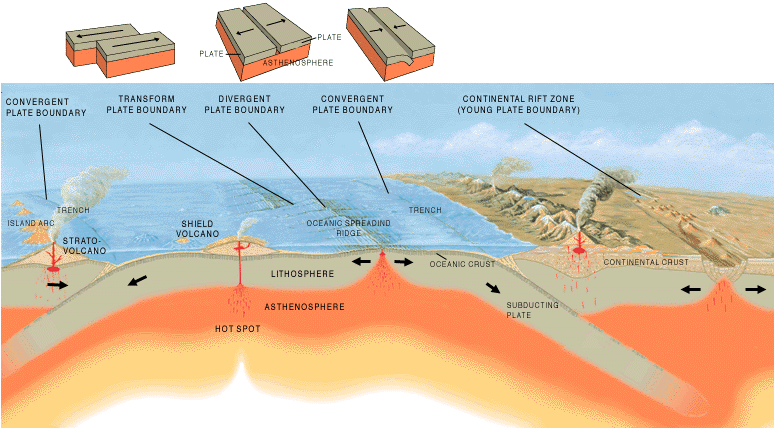 Students know how movements of Earth's continental and oceanic plates through time, with associated changes in climate and geographic connections, have affected the past and present distribution of organisms. Students know how to explain significant developments and extinctions of plant and animal life on the geologic time scale. 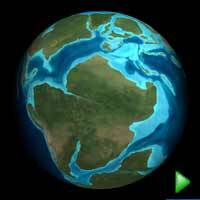 An animation of the last 600 million years of plate tectonics. Click HERE to access and copy the template. You and your partner will conduct research on one or more assigned geologic time epochs/periods/eras/eons. 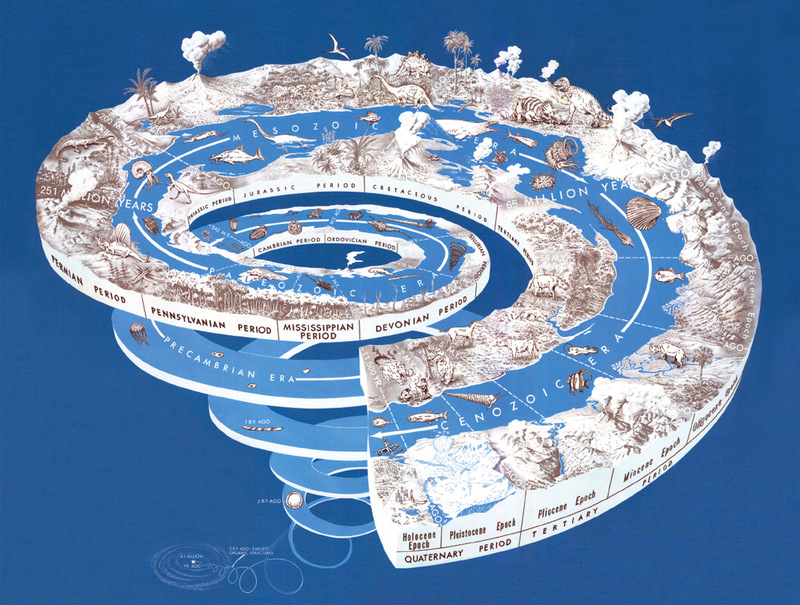 Together, your class will research the entire geologic time scale. Find out as much as you can through research of reputable sites and make a PowerPoint presentation to inform the rest of the class. Essentially, you and your partner need to become the class experts in your area of time research. With your partner, use the internet resources below and take notes about your assigned time eons/eras/periods/epochs. Search for other sites with caution. Evaluate every site for credibility - see your teacher for help with this. Note the websites you used for research in your presentation. Build a PowerPoint or Google Doc Presentation that will inform the rest of the class. Use artistic pictures of your time period throughout the presentation to give us a sense of what the planet was like at the time. WARNING: plagiarism is a serious offense! We will review summarizing, paraphrasing, and use of references in class. Give your presentation to the class. The rest of us will be taking notes! Turn in your presentation PPT file by flash drive or through sharing in Google Docs. Simply add one of the below links and show it to the class as part of your presentation! Don't see your research topic!? A specific movie was not available for you though you may have the era or eon of your time period available and you could show that. The easiest way to be able to show these movies in your presentation is to ctrl-click a link below and select, "copy link location". Next, paste the link (apple-v) on a slide in your presentation. When you show your presentation, all you will need to do is click the link. Child of WPA workers siting in a dinosaur footprint. Photo from Paluxy river quarry by R.T. Bird from the collection of Wann Langston. Trackway at Dinosaur Valley State Park, Blue Hole. Photos by Sue Hovorka, UT BEG.